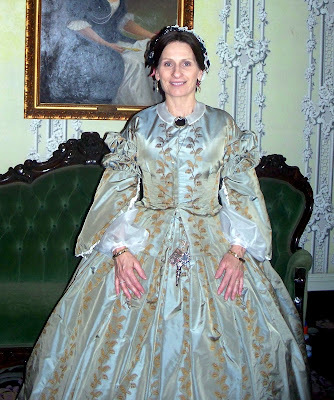 Recently my mother, Nancy, finished a Basque bodice to match the skirt that she made two autumns ago as part of a ballgown. Like some original dresses, this skirt has two matching bodices - one for daytime and the other for evening. This dress is in the style of a late 1850s- early 1860s dress. 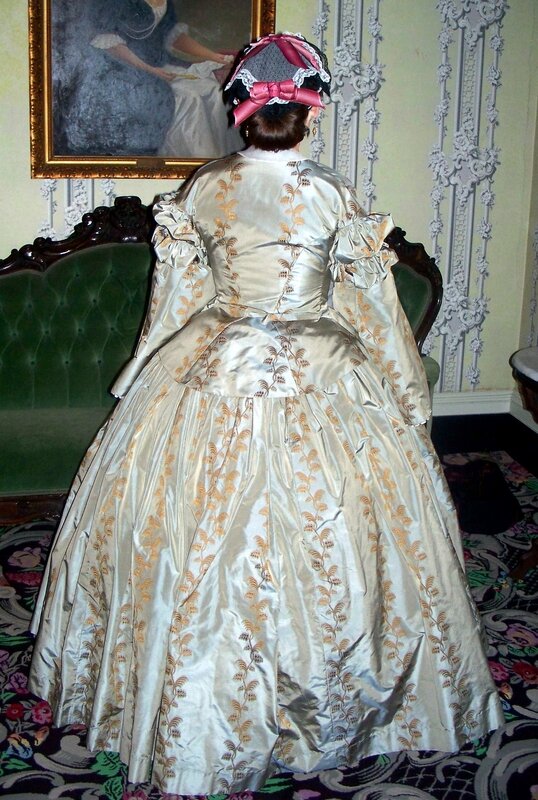 The Basque bodice, a fitted bodice with a peplum skirt, was popular in the 1850s and was often seen into the 1860s on women who were not as up-to-date in their fashions and would have hung onto some of the fashions of previous years. 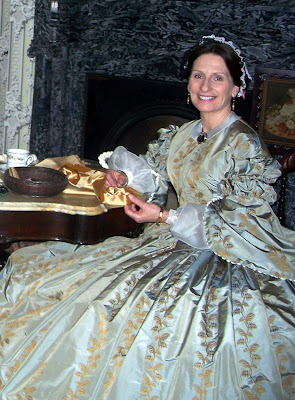 The dress is made of a beautiful silk taffeta with gold design woven into it. The sleeves have a gathered double puff at the top and an open pagoda sleeve. The undersleeves are sheer silk organza. The inside of the sleeve is trimmed in white silk ribbon about 3/4" wide that is box pleated. I've seen this treatment on several originals in the collection of Wheatland in Lancaster County. The collar is also made of sheer silk organza. Here is my mother, Nancy and her friend Audrey in the parlor at Wheatland. A chatelaine hangs at her waist, holding the essential sewing tools for sewing a silk apron. The cap is made of fine net and lace with ribbon trim and would be worn indoors. 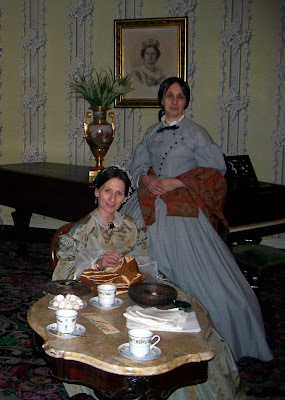 While at a recent conference for 1860s Ladies and Gentlemen. I took a class where there was a picture of an original that was VERY similar to Nancy's basque bodice. That is a gorgeous dress!!! Oh wow! That's just beautiful! It just says "wealthy"! I too enjoy the lady in the asymmetrical bodice dress! I love it! !